CinemaCon is the event in Las Vegas where all the big studios show off their upcoming movies to crowds of theater owners from across the globe. And that includes a brand new look at one of the year's most anticipated sequels. The first eight minutes of our Trek preview were a re-edited version of the 9 minutes we saw before The Hobbit back in December. No one announced that it had been re-cut, exactly, but there were some interesting changes. The scene features an Enterprise mission to stop a volcano from erupting on a remote planet and killing off the primitive natives. The whole mission is massively streamlined from the earlier cut. Which means director J.J. Abrams (who couldn't be at the presentation because he was still putting Star Trek 2 together) is still fiddling with his movie. And it works, so we're not complaining. One interesting tidbit we learned from this extended look was why it's so important for the crew of the Enterprise to complete this mission without detection. Because as the ship takes off from it's hiding spot at the bottom of the sea, the locals flip out. They ditch their sacred scrolls and instead begin worshipping an outline of the Enterprise. To which Kirk remarks, cluelessly, "So they saw us. What's the worst that can happen?" Spock is miffed. Kirk is laying into Harrison for the terrible things he's done, but the Batch is playing it cold. For unknown reasons, Kirk has to make a deal with the devil, so he can get onto Harrison's mystery warship that was made strictly "for combat." In return for Harrison's assistance, Kirk guarantees the safety of Harrison's crew. This is where it gets good. Harrison, utilizing his best dragon-tongued laugh, smiles and responds, "Captain, you can't even guarantee the safety of your own crew." Cold as ice. The whole place got chills. I'm still surprised people didn't just start tossing money at the screen. We've all heard Cumberbatch narrate melodramatically over the trailer, and we've seen a few exchanges between him and random character that don't hold a ton of emotional value — but this was our first glimpse of an uncut Cumberbatch scene. Harrison dresses down Kirk so perfectly, it's almost like watching the male, human version of Maleficent on screen. 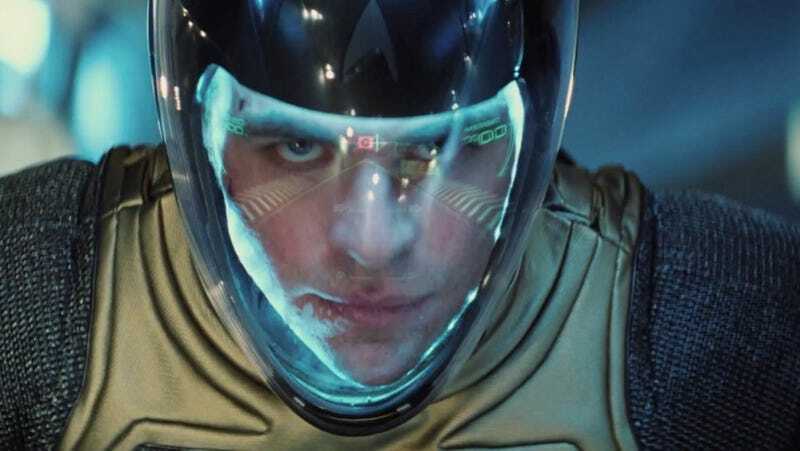 The deal is set — and as with all things Star Trek, Kirk conjures up an incredibly complicated plan, that hinges on both luck, dashing heroism and the lovable bumbling of Simon Pegg's Scotty. In order to get from the wrecked Enterprise to Harrison's ship, Kirk and his captive have to space-jump themselves through (what look like) pieces of Enterprise debris and into the loading dock of the other ship. The idea is wildly problematic (as Spock is quick to point out) and it only gets worse as Kirk becomes dependent on his enemy for help). The space jump truly feels like a sexed-up old-school Trek episode. And it's hilarious — if you liked Pegg in the first Trek, then there's good news: His character is given double the space to goof around in Into Darkness. And yet, he still totally kills a guy in it, and we laugh. It's messed up. Pine is being so goddamn dashing, we worried the magical bean of Cary Grant essence he stole from an old crone would come tumbling out of his mouth. Meanwhile the not-quite-gelled family of crew members continues to play off of each other. Bones is lobbing insults at Spock, while Uhura continues looking generally exasperated with the whole mess of gentlemen aboard the Enterprise — minus the eyes she gives Spock. But more importantly, Kirk's decision to give the villain all the power and his trust touches on something Pine addressed before airing the new footage. This movie is about Pine "earning the Captain's Chair." He's doing what is right to save his crew, no matter how risky. This is the Kirk we're more familiar with from the original series. On an even more positive note, the lens flare is all but gone. The new Enterprise still looks like an bright Apple store of the future, but it's no longer glimmering like a disco ball. And the tech is rad. Inside each spacesuit is an interactive display that plays a huge part in the space jump. The correct jump path is lined up perfectly to their helmet, and is just begging to be turned into a video game. So far, so good, Star Trek Into Darkness.